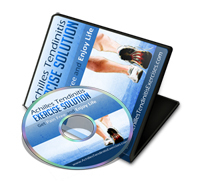 Tight or fatigued calf muscles, which transfer the burden of running to the Achilles. This can be due to poor stretching, rapidly increasing distance, or over-training excessive hill running or speed work, both of which stress the Achilles more than other types of running. Inflexible running shoes, which, in some cases, may force the Achilles to twist. Runners who overpronate (feet rotate too far inward on impact) are most susceptible to Achilles tendinitis. The recommended treatment for Achilles tendinitis consists of icing, gentle stretching, and modifying or limiting activity. Nonsteroidal anti-inflammatory medications (NSAIDs), such as ibuprofen or naprosyn, can reduce pain and swelling. Physical therapy and the use of an orthosis (heel lift) can also be helpful. For chronic cases where tendinosis is evident and other methods of treatment have failed, surgery may be recommended to remove and repair the damaged tissue.